When the mind turns to salami, where does it first go? Sigmund Freud made a living off of this question. Your author, the Gen-X son of a New York shrink, thinks of Katz’s Delicatessen. If you prefer wordplay to foreplay, maybe it’s to Jon Agee’s compendium of palindromes, Go Hang a Salami! I’m a Lasagna Hog! 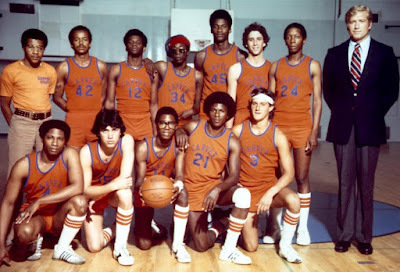 And then there are those of a certain age—the age, say, of the founding members of the NOTY High Committee—who conjure one Mario “Salami” Pettrino, reserve guard on the Carver High School basketball team in the CBS drama The White Shadow (front row, far right). One of them will now take over this post for a couple of paragraphs to drop some knowledge, or Coolidge, on you. The White Shadow—which aired from 1978-81, precisely when the High Committee was in high school—helped usher in the era of gritty, high-concept Quality Television like Hill Street Blues, E.R., and Homicide. Created by Bruce Paltrow (Gwyneth’s dad), The White Shadow tackled it all: gun violence, teen pregnancy, absentee fathers, homosexuality, STDs, drugs and alcohol. It was serious without being (too) didactic, genuinely funny, and often downright moving. Bill Simmons says it changed his life. Here’s a nice appreciation by Nell Beram in The Awl. The show was terrific. You should watch it. Salami was the white punk transplanted New Yorker. In one episode he unwittingly shares prescription amphetamines with the team. In another he is seduced by a teacher. Salami was played by Timothy Van Patten, who would go on to direct the Quality TV that descended from the descendants of The White Shadow—including episodes of The Sopranos, The Wire, and Game of Thrones. Which brings us to the second round of the Bulltron Regional, where we find another Salami, No. 1 seed Salami Blessing, a 23-year old chemical engineer from Nigeria, a land rich in oil, sesame, and names. Nigeria has given us NOTY luminaries such as ex-president Goodluck Jonathan and top-100 international Scrabble player Ben Quickpen. So it is perhaps no surprise that this 2016 interview with Blessing doesn’t even bother to get into the provenance of her name. The whys and wherefores, however, are not always of immediate concern. What inspired Richard Mather to name his boy Cotton, and Cotton to up the ante, naming his offspring Increase? Why did 2008 name-inee Perfect Engelberger call her son Dom Perignon Champagne? Who sent us this Salami? Sometimes, though, the stories of how names come to the High Committee’s attention merit retelling. Sure, the majority arrive via email (for which, thanks), spotted by you (and us) in, more often than not, the ninth paragraph of a local news report about a holdup at a gas station. But sometimes a Committee member tears off the side of a moving box and submits it as validation. That was the case with Jerome Fruithandler (NOTY 2004, Hall of Name 2008). This NOTY offseason we heard from a grandson of Jerome’s asking for “something noting the victory. Something for the family” to honor his late grandfather. Until the Hall of Name becomes a brick-and-mortar tourist destination, however, the best we can offer is a virtual salute. Perhaps this year a Salami Blessing. Dan Wachtell is a lawyer, soccer enthusiast, and occasional writer living in Brooklyn.